I Broke My Ankle While Avoiding a Dog on the Loose. Can I Do Anything? Home » The Law & You » I Broke My Ankle While Avoiding a Dog Coming At Me. Can I Do Anything? I Broke My Ankle While Avoiding a Dog Coming At Me. Can I Do Anything? While passing a neighbor’s house, a viewer says a dog came running toward her. Trying to avoid the dog, she broke her ankle. Later, she learned the neighbor had an electric fence yet there was no fence. Can anything be done? Personal injury lawyers Greg Fellerman and Ed Ciarimboli suggest some legal options. 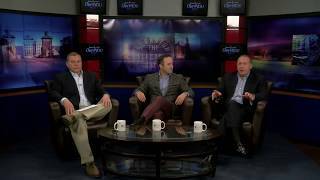 Dave Kuharchik: We’re talking about a dog on the loose for this edition of “The Law & You.” Attorneys Greg Fellerman and Ed Ciarimboli, we let them in the studio. They have no harassment walking through the door. Ed Ciarimboli: No, no dogs on the loose here. Dave: No animals. We keep it safe around here. All right, our question tonight involves a dog on the loose. Nancy from Kingston says, “I was walking past a house that has a dog the other day and no fence. The dog came running at me. I stepped off the sidewalk and broke my ankle. Apparently, they had an electric fence but there was no sign.” What can Nancy do here? Greg Fellerman: It’s a duty to warn. Ed: Yeah, your instinct is going to be, “Oh my gosh, I got to get away from this dog.” And take a step back. So the lack of a sign is, I think, a problem for the homeowner here. Greg: Yeah, and the other thing too is at this time of the year, in spring, people are walking. Please make sure you’re leashing your dog, that if you’re putting them outside that they’re properly secured. We’ve had cases where no leashes, they break off the leash, or they break out of whatever confines you have them in. Please make sure you’re doing that because a lot of times, people do get injured from these dog bite cases and it’s not a good thing. It really isn’t. Ed: This is a dog scare case. Dave: Another legal mystery solved. If you need the help of the guys, you can reach out to them. Results matter with attorneys Greg Fellerman and Ed Ciarimboli. We’ll see you next time.